One of the weird Rhopalosiphum I have collected, this one from a Crataegus shoot in the intense shade of a thicket near a stream in eastern Washington. species exist than are accounted for in the keys? Is it because of crazy variation of each species in terms of habitus, color, or morphology? Am I just a knucklehead? Maybe as time allows I will add more photos and discussion. 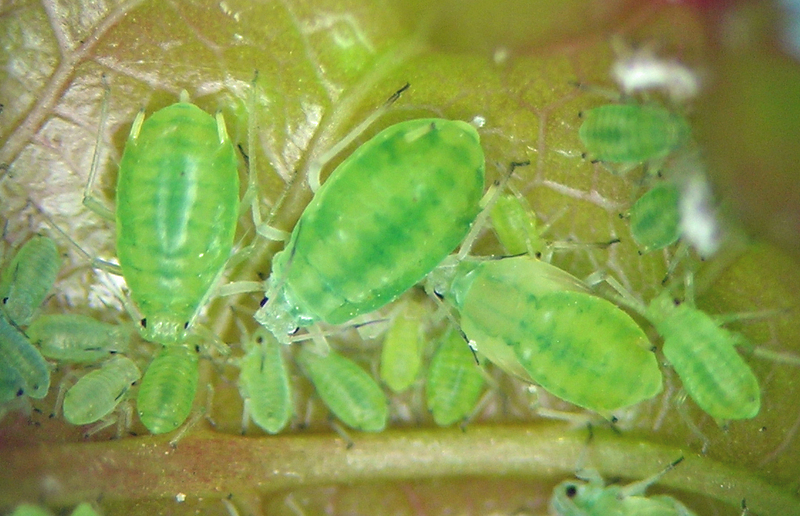 Rhopalosiphum species mostly feed on Prunus and relatives as primary hosts, and monocots as secondary hosts. 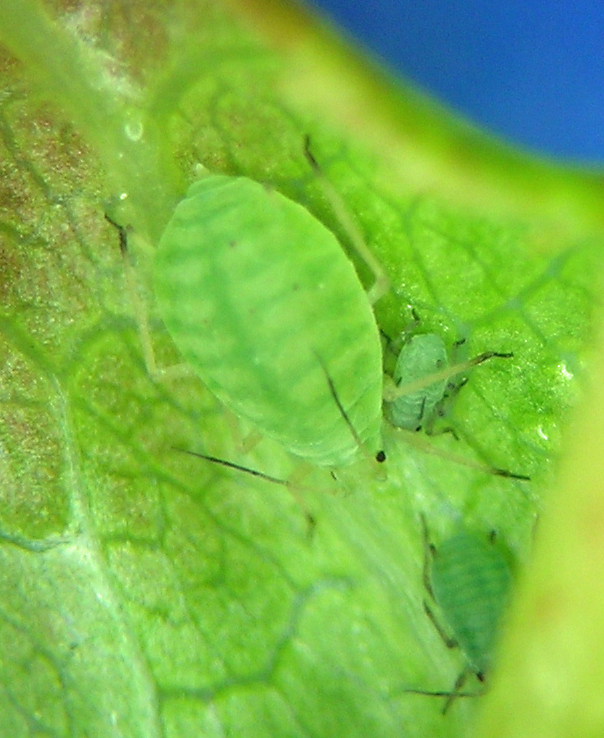 Once slide mounted the genus is fairly easy to recognize among aphids in western North America, but as Blackman and Eastop note, the generic limits are not well-defined from a world-wide perspective. A Rhopalosiphum similar to R. nymphaeae on Prunus near Spokane, Washington in May. Since moving to Lakeview in southern Oregon, I have been studying a Rhopalosiphum on Prunus subcordata. 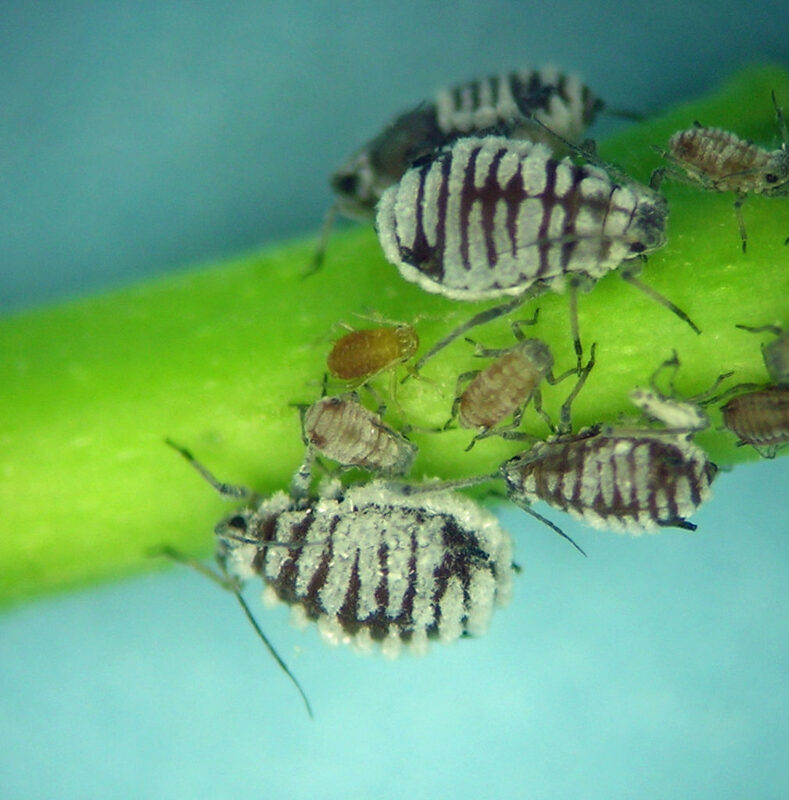 It is a truly striking and fabulous aphid, with the bold wax bands, the dark coloration, and the propensity to develop into stunningly large populations on this shrubby plant commonly known as Sierra plum. An as-yet unidentified Rhopalosiphum from Prunus subcordata in southern Oregon. Specimens like those below on chokecherry trouble me because they seem to be one species, in this case Rhopalosiphum padi (L.), but were found on the typical host plant of another species (in this case, R. cerasifoliae). Copulating male and oviparous female of possibly Rhopalosiphum padi on chokecherry, R. virginiana in northern Idaho in October. This species uses chokecherries as primary host (e.g. Prunus virginiana), and apparently migrates to Cyperaceae. Despite collecting near and among chokecherries on almost every collecting trip I make, I rarely find this aphid. I have no records of it from secondary hosts. So, yet another frustrating Rhoposiphum species to understand. When on chokecherry, it causes a leaf roll, tends to occur in very large numbers, and is easy to recognize even int he field. Rhopalosiphum cerasifoliae from chokecherry in Boise, Idaho in early may. 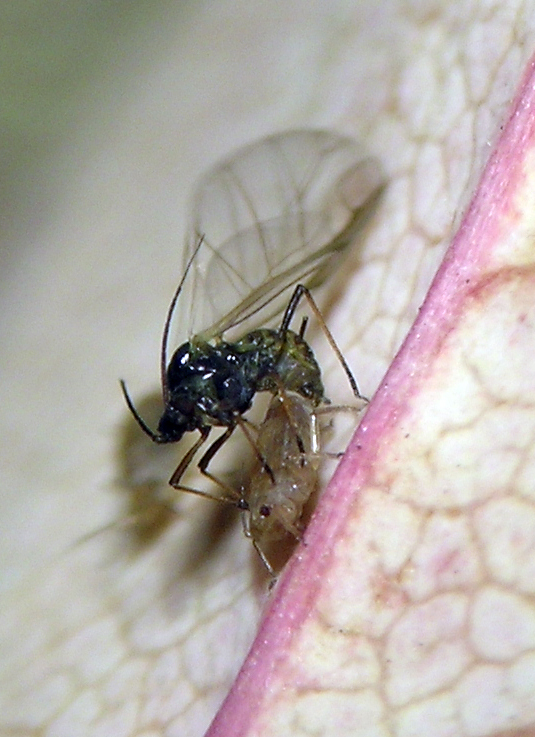 I often check Typha (cattail) for aphids everywhere I go, and after many years of this, I finally found this aphid in late May of 2004. This species is reported to be monoecious holocyclic, which requires that it ovewinter as eggs on or associated with Typha. 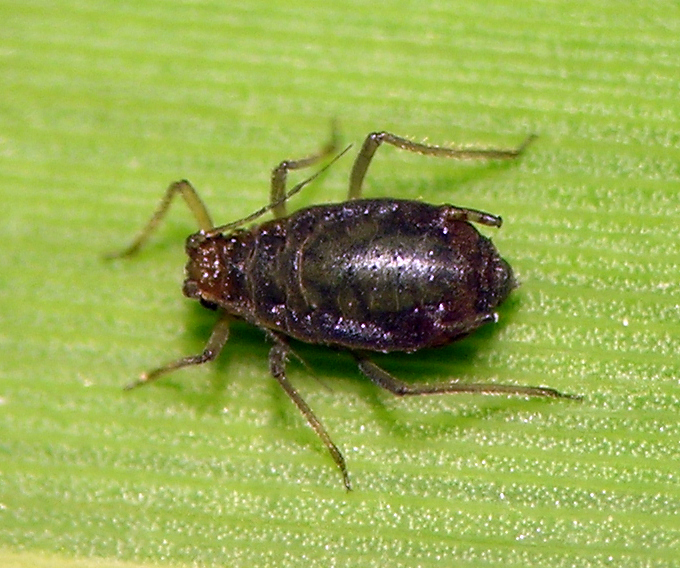 Most places Typha grows in western North America are completely inundated with water during the winter, possibly causing the extreme rarity of this aphid. The site where I found it was a small man-made retaining wall near a man-made reservoir. This retaining wall maintained a steady water level behind it, allowing the Typha to experience a constant water level. 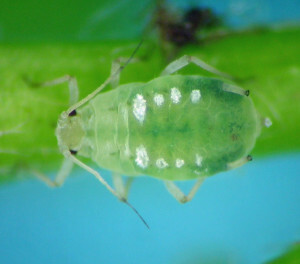 This aphid was therefore, it seemed to me, able to survive year after year in this site due to the predictability of the habitat. I visited the same site in early June of 2010 and easily found many more specimens. Rhopalosiphum enigmae from central Washington in early June. 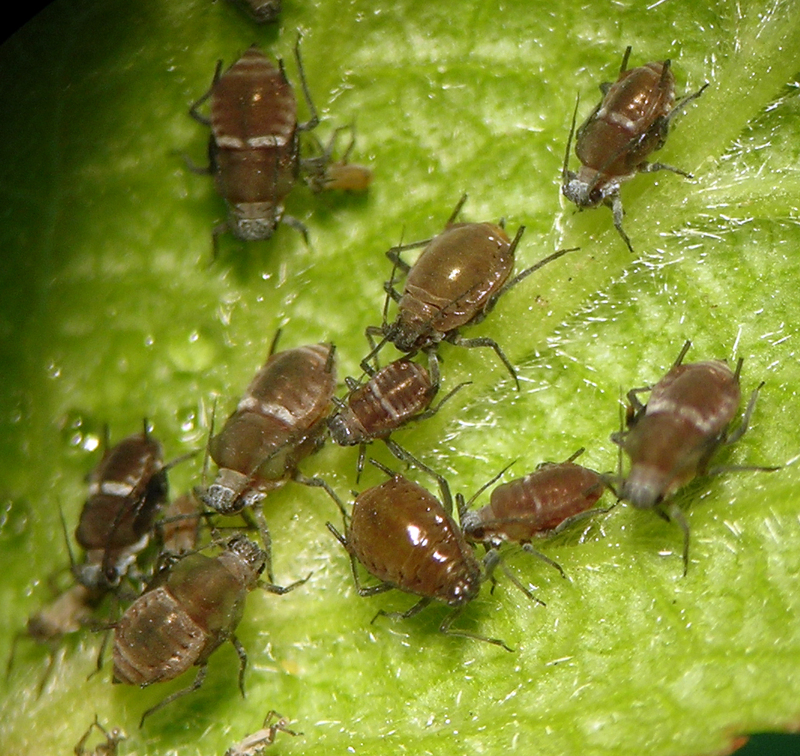 Rhopalosiphum oxyacanthae fundatrix on Crataegus in southern Idaho in April. 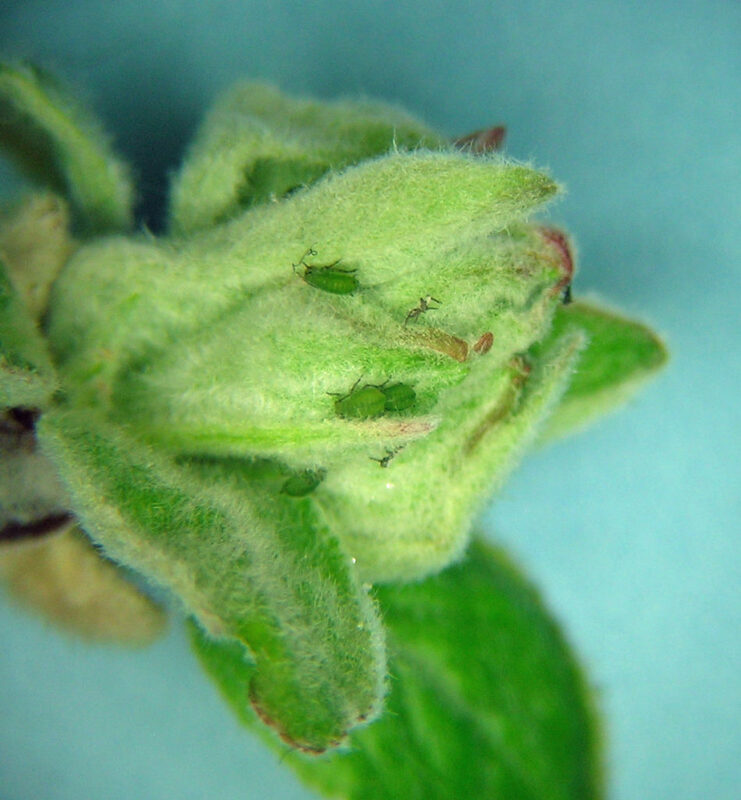 Rhopalosiphum oxyacanthae fundatrix nymphs on a bud of apple in Lakeview, Oregon in April.